Love at first bite best describes your relationship with our Steak & Beans Burrito. From the moment you taste our juicy steak strips cooked with premium pinto beans, spiced to perfection and wrapped in a bakery-fresh tortilla, it will leave your mouth singing your favorite love song. Just in case, you better get two. EL CHARRITO® Beef, Bean & Cheese Sauce with Red Chilis Burrito delivers with seasoned beef, luscious pinto beans, melted cheese and fresh red chilis – classic Mexican flavors that will keep you coming back for more. Put the instant pot away and enjoy DON MIGUEL® Carnitas Burrito that tastes just like home-made. Slowly simmered seasoned pork, tomatillos, savory onions and rice all combined with a zesty cheese and wrapped in our freshly baked flour tortilla. So, when your friends arrived unannounced, you can be ready to delight their senses in minutes. It’s time for dinner and visions of carne asada are dancing in your head! Grab our flavorful, grilled fajita-seasoned steak with roasted onions and bell peppers cooked slowly with cilantro lime rice and wrapped in our fresh-baked flour tortilla. You can jack up your burrito at home with sour cream, pico, salsa or shredded cheese and let the party begin! Life is busy and you want a restaurant-quality meal, but who has the time? Bring home the taste of gourmet with The DON MIGUEL® Chicken, Black Beans & Cheese Burrito is stuffed with our slow-cooked, seasoned chicken breast, savory black beans and a blend of three cheeses all wrapped in hand-stretched tortillas fresh from our bakery. Eat like you deserve it! Start your day right with THE BOMB® Breakfast Burrito that satisfies every craving with really big flavor and gets you off to perfect start! Stuffed with scrambled eggs, bacon, sausage and ham, spicy potatoes, and melted cheese all wrapped in a soft, warm tortilla. Real ingredients for your real life. For those with a mighty appetite, THE BOMB® Chipotle Chicken Burrito combines seasoned chicken, zesty cheese, savory beans, tomato, onions, and red bell peppers to make a whopping, 14-ounce burrito that will eliminate all trace of your hunger. Available at your local convenience store today. Be the life of your next party with DON MIGUEL® Chicken & Cheese Mini Tacos. All-white meat chicken, two Mexican-style cheeses and roasted corn salsa wrapped in a crispy corn tortilla. This authentic Mexican-inspired snack is sure to be a crowd pleaser. Available for your convenience at participating Sam’s Club locations. Conquer snack time like a pro with DON MIGUEL® Chipotle Chicken Mini Tacos. All white meat chicken seasoned with mild chipotle chilis wrapped in a crispy corn tortilla. Simple ingredients that are simply amazing. Serve with Wholly Guacamole for an even better experience. Available for your convenience at participating Costco locations. 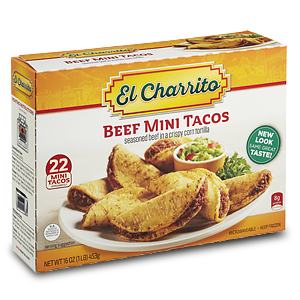 Conquer snack time like a pro with EL CHARRITO® Beef Mini Tacos. Real seasoned beef in a crispy corn tortilla. Simple ingredients that are simply amazing. Serve with nacho cheese and salsa for a tasty Mexican-inspired snack.